I wrote about the philosophical error of subjectivism—the belief that we only have access to our own ideas and not to any objective reality. In this post I will address that error by arguing that our ideas can be objective. The senses are faculties that we use to obtain information about the world. The eyes probably provide the most influential information about the world. The eyes are not a sensation. The eyes are an organ that we use to get sensations which lead to perceptions. According to the philosopher John Locke and subsequent philosophers, sensation and perception are both forms of ideas. The grand mistake is to believe that ideas are that which we perceive. The truth is that ideas are that by which we perceive. The difference is one word “by”. What difference does this one word make? Think of the meaning of the sentence, “A brush is that which I am painting” and the sentence “A brush is that by which I am painting.” In the first sentence I am painting an image of the brush on the canvas. In the second sentence I am using the brush to do the painting. We are not aware of our ideas that are the result of our sensation and perception. We are only aware of the cause of our ideas. 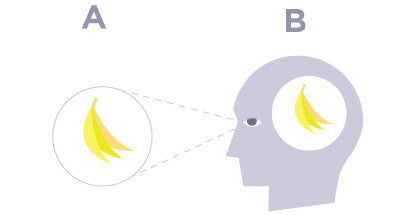 For example, when we use our eyes to look at bananas, we are not aware of the light that hits our retina. Nor are we aware of the physiochemical process by which our brains interpret that light. We are only aware of the cause of the perception— the bananas. We have direct access to the bananas which is the object of awareness. In the picture below subjectivist philosophers would say that we do not have direct access to banana (A) we only have access to a "representation" of (A) expressed in figure (B). This is the major error. Let me review the difference between objective and subjective. Objective is that which is the same for everyone. Subjective is that which is different for everyone. Everyone with senses has direct awareness of objects in reality. This means that everyone has access to objective reality. We experience actual reality. We do not experience anything through the senses unless it actually exists in reality. The significance of philosophers should not be underestimated. Their ideas can permeate society for generations. It is very important to closely scrutinize the most influential ideas of philosophers. As Aristotle said, "The least initial deviation from the truth is multiplied later a thousandfold." Enlightenment philosophers such as Descartes and John Locke were very influential. Many of these philosophers made a very crucial error concerning the relationship between the ideas and the intellect. Here I will briefly explain this error and point out the consequences of the error. The error: Many philosophers believe that a person is only conscious of his own ideas. We are not aware of anyone else's ideas. We can only infer the ideas that other people have based on what they say and do. When we think of an apple, we have an idea of the apple in our mind. This idea may be a percept, a memory, a sensation, or a concept. One only perceives his own ideas. The consequences of this error: 1. Objectivity is destroyed. "Objective" refers to that which is the same for everyone. "Subjective" refers to that which is different from one individual to another. If we are only aware of our own ideas then ideas are merely subjective since we have no way of knowing if ideas are the same for everyone. 2. It leads to skepticism. If one only perceive his own ideas, then when one looks at an apple he/she is only aware of the representation of the apple in their mind. He/she is not actually aware of the apple in reality. One can guess that his/her idea of the apple is a good representation of the real apple, but he/she has no way of knowing. Why? because we can only tell if a representation is accurate by comparing the representation to the original. Since we have no access to the original we have know way of knowing whether our senses our trustworthy. Therefore we cannot directly apprehend what reality is like. In my next post, I will show why these ideas about ideas are wrong.